Size: 504 sq.ft. - 615 sq.ft. Raymond Codename Beyond (P51700019265) is a newly launched development by Raymond Realty onto the vast acres of the region. Its exclusive location and the way of architecture are redefining the skyline of Thane West, Mumbai. This is the first ever project by Raymond developers in Thane location, the first phase of the project has already got a rapid response from its launch date itself that is planned to be built beyond your expectations. Raymond Realty is partnered with the top names like Hafeez Contractor for Master Architecture, Faquih & Associates India for the interior designing, Godrej & Boyce for Green Home Certification, Epicons Consultants for Structural Consultancy, Ramboll for MEP of the project & Cracknell for landscape design. The first impression is the last impression and the developer is all set to create the first impression on property buyer across national and international buyers. Raymond Realty has received all important approvals and permissions from the authorities for this development. Raymond Codename is having two phases where the 1st phase will be delivered by Quarter 2 of 2024 from the starting rate of INR 1.06 Cr. 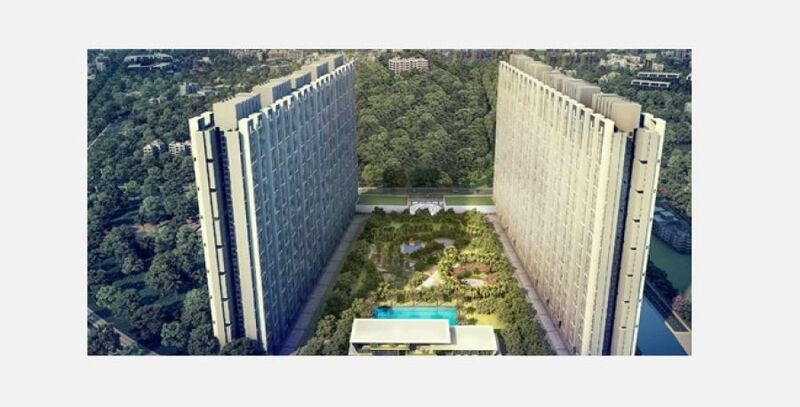 Raymond Realty has occupied about 100 acres of land for its prime residential launch where 14 acres is dedicated for development of residential towers, 5 acres for 50 unique amenities and the rest for a huge open area around the township. There will be more than 10 residential buildings with a configuration of 2 BHK Nest and 2 BHK Haven. Every flat offers you private views and is designed to offer stunning lush views and natural lights to your ventilated rooms. The rooms of Raymond Beyond Thane are commodious and widely spaced. Being situated at the peaceful surroundings the residence will discover a rejuvenated and refreshed sunny day with the twittering of birds every morning. The 2 bedroom units are ranging between the carpet area of 515 Sq.ft to 635 Sq.ft obtained by the magnificent towers of 43 floors each. One of the major features of this project is it will have central landscaping of 1500+ trees & a clubhouse spread over the area of 25000 Sq.Ft. Phase 1 consists of 5 quality structured buildings in a row by next to each other. Thane is the famous place in Mumbai to buy or invest in residential properties and also known as the city of lakes surrounded by the beauty of scenic hills. Raymond Realty has selected this city to make up their first residential edifice that going to host luxury of choices and facilities by keeping in mind the demands of new generation people. Within the township, Raymond Realty will launch another branch of Singhania High School. Smt. Sulochanadevi Singhania School is one of the Mumbai’s No. 1 Educational Institute located near the township at Pokhran Road, Thane West. Thane is another destination which is blessed with various projects by reputed as well as average developers. All key locations are at a stone throw distance and offer convenient advantages to you. Thane is connected to IT hubs, Business District and social infrastructure. Regions like Pokhran Road 1 & 2, Teenhath Naka, Mumbai Nasik, Ghodbunder Road. Other than these advantages the project brings you everyday ease and comforts right at your doorstep. The site address of Raymond Codename Township is – Pokhran Road 1, Thane West, Mumbai, Maharashtra. Raymond Realty is the foremost real estate company since last many years. It is one of the divisions of Raymond Group which was incepted in the year 1925. Raymond Group is into Textile & Apparel, Engineering in National & International Market, FMCG, and Real Estate sectors. Each and every project of the group is meant to reach expectations of home buyers. They focus on every small detail of the projects ensuring an elite living standard. By presenting the world-class residences the company aims to build its reputation in the construction sector as well and to become the most diversified company of India. Raymond Codename is enriched with rich comforts and unmatchable amenities such as Green Building, Energy Efficient Electrical Fixtures, Mini Theatre, Banquet Hall, Scenic Infinity Pool, Cafeteria, Children Play Area, Sky Terrace, Spacious Deck, Multipurpose Room, Gymnasium, Car Parking, Retail Stores, Elevators, 24 hour security, Elevated Walkway, Emergency Medical Service, Continuous Water Supply, a Nature Forest with Flower Tunnel and a lot more to be added. Schools - Singhania School, D.A.V Public School, Merry Angels International School, Euro School. Hospitals - Fortis Hospital, Diamond Hospital, Bethany Hospital. Shopping Malls - Lake City Mall, Korum Mall, Viviana Mall, Eternity Mall. Restaurants - India Bistro, China Bistro, Bombay Barbeque, The Yellow Chilli, Utsav Restaurant. Railway Stations - Thane Station, Upcoming Metro Station, Mulund Station, Kalyan Station. Airports - Navi Mumbai Airport, Mumbai Domestic & International Airport.